It doesn’t happen often that I am proud of myself, but today I am :)! You wonder why? 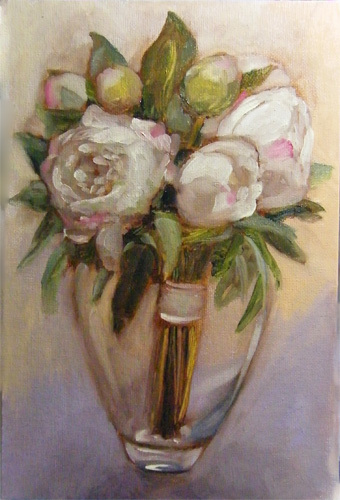 Well, I managed to pick up my brush again and started with one of those lovely little 1-hour-oil-paintings. Yay! Think I haven’t painted for about 6 months or something like that. 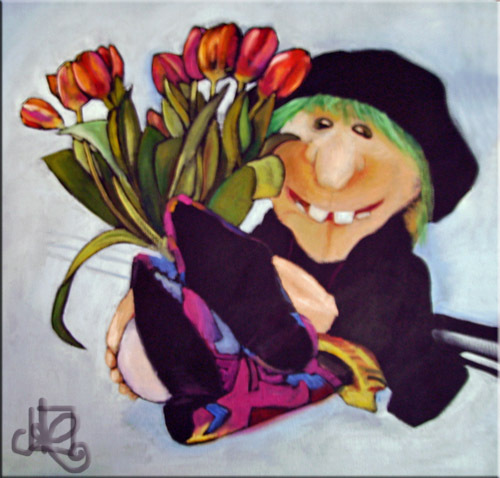 By the way the beautiful ref for this painting originates from the WetCanvas RIL and was published by climber-man. Thanks!!! Hopefully I will finish at least two more paintings this week :). Yay, I’m back to my 120 oil paintings challenge. Since I’m not counting the small stuff I wasn’t very pleased with, this is officially the number 7 of 120. And yay for linseed oil, too. I’m starting to get used to it. The dwarfs in this painting that have taken Gulliver-pear prisoner are jelly bears. At first glance they seem so bouncy, tender and squeaky, yet they’re mighty dangerous! You start eating just one -and you find yourself in not time having eaten half the bag of sweets. Pears have something very interesting about them, something that just seem to captivate the attention of many artists. 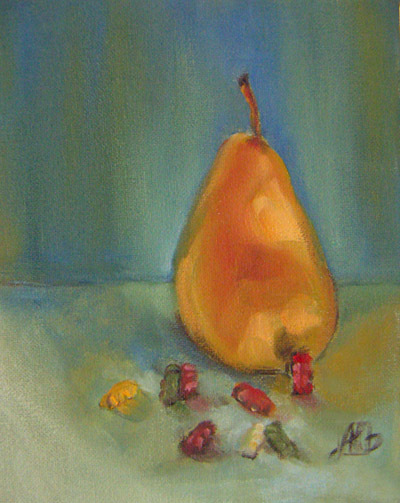 Let an artist choose a fruit to paint and she or he will most likely choose a pear. Me, too. I don’t know how many pears I have already painted and sketched, just search this blog, and I’m sure you should be able to find at least three more paintings of pears. These curves are just fantastic to paint, I only wished pears would come in more colors, just like apples do :). 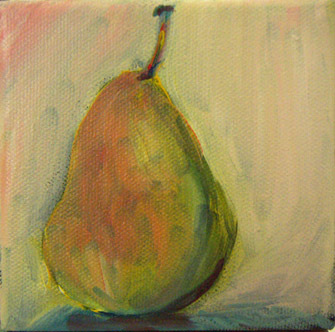 This little pear here has been painted with Oil Colors on a miniature canvas (10 cm x 10 cm). Like most of the time I’m using water miscible oil colors. I prefer them, because brushes are so easy to clean and I do not have to handle turps. However, there are some limitations to these colors as well. First of all they tend to be more firm in their consistency compared to regular oil colors and one needs special mediums to make them more creamy/fluid. Another bis disadvantage is, that they cannot be used for glazing techniques. At least I haven’t found a way yet to thin them which would not affect their water miscibility. 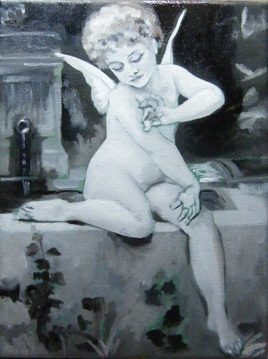 You are currently browsing the Oil Color category at : silviasblog.com :.